Alonzo Pratt, alias Robert Grant has always survived by his wits, working his way up from petty pickpocket to polished con artist. Saddlebags bulging with disguises, he is a master impersonator, whether limping in Civil War uniform or toting a Bible and dressed in black. On occasion, a tin star pinned to his vest is just the ticket to winning the trust of his innocent marks. When Federal Marshal Jacob Stone happens to come across another lawman while taking in a wounded prisoner, he’s grateful for some assistance. And when he hears tell that Cal Grissom’s gang is roaming these parts, he enlists Deputy Grant to help him track down the thieves. But he does wonder why his new partner seems so…reluctant. Alonzo never planned to join a manhunt. But now he’s shooting Sioux and rescuing an outlaw’s gorgeous daughter. 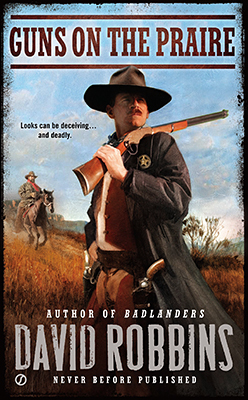 His disguise may have fooled the marshal, but it won’t stop lead…. David Robbins has come up with a top class western with Guns on the Prairie. Excellent characters on both sides of the law will soon have you laughing with them, fearing for their well-being, hoping they survive or met their demise. Alonzo Pratt’s frustrations, confusions and despair at the situation he finds himself in is superbly described by David Robbins. Fleshing out of characters is to tell their backstories, all which will have a part to play in how they deal with the dangers that face them. There’s plenty of action and cliff-hanger chapter endings making this a truly difficult to put down read. You will certainly be wanting to find out what happens next. The pacing is perfect as the tale races towards its gripping final standoff that could end in any one of a number of ways, and I doubt you’ll guess how the book does conclude, as one of the surviving characters says, “This didn’t end as you thought it would, did it?” No it certainly didn’t, but it does finish in fine style making for an extremely unforgettable ending. 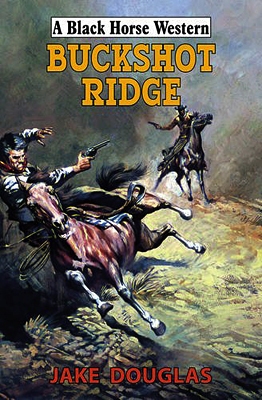 If you only read one David Robbins western this year then make sure it’s this one. If you’ve yet to try his work then I urge you to grab a copy of this book, it really is a great read. 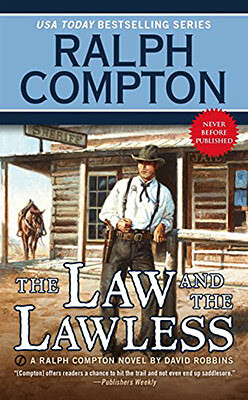 Just when order returns, veteran lawman, L.T. McAllister rides in. He’s a dangerous man determined to do what’s right regardless of the personal loss. L.T. believes himself ready for anything until he meets Sarah. Her ideas about the man he’s become soon pit his lifetime of duty against desire. L.T.’s and Sarah’s loyalty to Will catapults them into a life for which neither one is prepared. And when L.T. and Sarah defy Sheriff Grant Simpson, they trigger a cataclysm of retaliation that escalates into kidnapping and murder. L.T. and Sarah are forced into a battle for justice…and their lives. Janet Squires tells her story in visual prose, her descriptions of places make you believe you are right there viewing them first-hand. Her character studies are excellent too, you share their feelings be they happiness, sadness, frustration, anger and fears. Her words flow smoothly making this book a joy to read. There aren’t that many characters in this story and Squires mainly switches between Sarah and L.T. as they become drawn to each other, yet fear acting on these feelings. But the growing love between them must take second place to the search for stolen gold and the running of the ranch. The opening chapters deal with Sarah struggling to adjust to her new life in America, but her strong will sees her dealing easily with all the hardships thrown at her. It’s when L.T. arrives on the scene, and the anger he brings with him that attracts violence, that we see cracks appearing in her character. 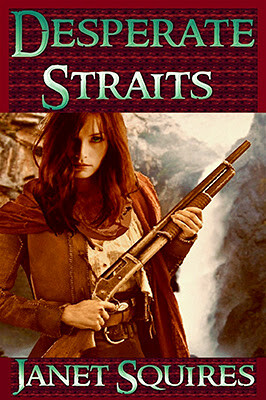 Although the storyline follows the trail seasoned western readers would expect it does offer some neat surprises, not least what happens to Sarah and L.T. emotionally and physically making for a powerful ending in a tense and exciting final showdown with Sheriff Simpson. 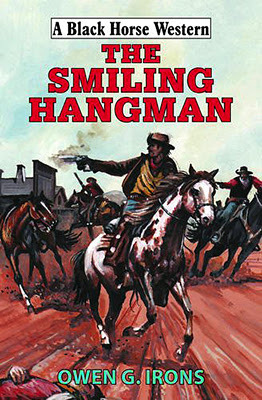 If you like westerns filled with terrific character development and gripping action scenes, believable dialogue and touches of humour, then, like me, I’m sure you’ll enjoy reading this book. 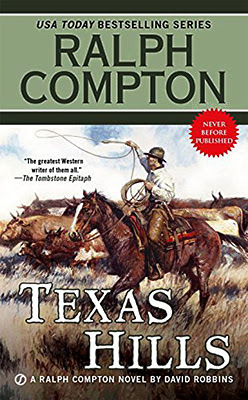 It is meant to be a day of celebration in Mortimer, Texas, but everything changes when Charlie Jefferson arrives in town. Left for dead after a brutal ambush and robbery, Charlie is intent on finding the man who did this to him. 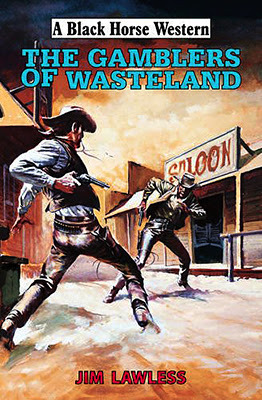 En route to Mortimer from the wastelands where he was left to perish, Charlie stumbles upon a dying Texas Ranger. Unwittingly, he is drawn into a plot involving the town’s council. By showing mercy, Charlie becomes part of the plot, whether it ties in with his plans or not. Charlie’s mission in Mortimer is no longer personal. The fate of the whole town rests with him. Will DuRey returns to Charlie Jefferson who first appeared in his last book, Arkansas Bushwhackers. Charlie is heading for home, and to the girl who is waiting for him, his stake hidden in his saddle. Of course this saddle is one of the things stolen from him, so he must get it back as he needs the money it contains to start his new life. 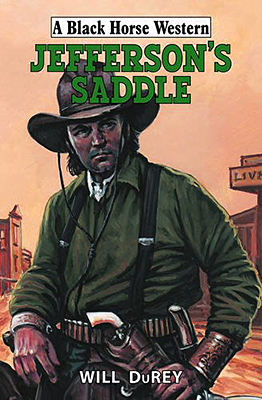 The saddle’s whereabouts is the mystery plotline in this very fast paced story. DuRey lets the reader in on the con trick being played on the town and seeing how Charlie finds out about this, and deals with it, makes for some gripping reading. This and the missing saddle aren’t the only problems Charlie has to deal with, for there’s an attractive, unattached, girl who takes a shine to him. How can he let her down without hurting her especially after she risks her life to save him? It’s no surprise that all these story threads become entangled and lead to an exciting final showdown that resolves everything neatly, leaving me hoping that we haven’t seen the last of Charlie Jefferson, because I for one would certainly read another tale about him. 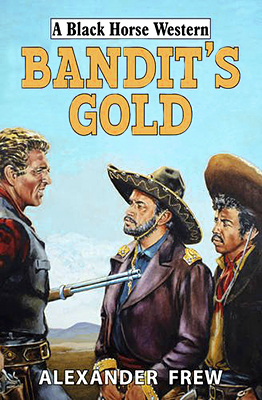 When Joe Flint meets Matt Harper and Pete Brogan, he cannot help but be enticed by their tales of gold and mystery. They tell him of a legendary Mexican leader who reigned during the civil war, funding his leadership through a criminal network. Drawn by the promise of fortune, he follows his two new friends who are determined to find out the truth about the fort where the Mexican leader lived. But, along the way, they are attacked. Flint learns too late he has put himself in the hands of a madman. Will he find his fortune? Or has Flint got himself into a situation too dangerous to get out of alive? 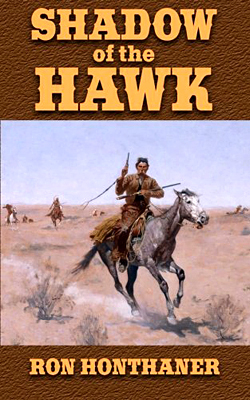 This is the second Black Horse Western to be published under the author name of Alex Frew* and the first I’ve read. With fairly small print and chapters beginning a few lines down from the end of the previous one rather than on a new page, this is one of the longer BHWs I’ve read. 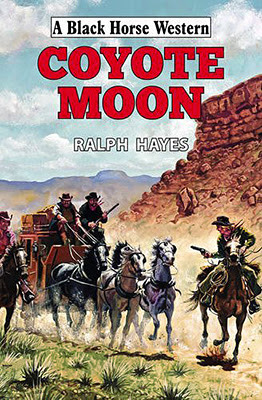 In fact Hale seem to be publishing westerns of this length much more often these days. Frew puts his hero into all kinds of danger from the outset. It isn’t long before Flint and his companions find themselves joining a rebel army under a superbly drawn bad-guy whose appearance would fit into any horror novel. Being part of an army that will turn on Flint if he gives his real reason for being there away means he and his two friends are up against far superior odds that they can’t hope to beat in a fight. There are some tense scenes, not least when Flint finds himself flung into a pit containing a mad bear. How he escapes is probably the highlight of this story and makes for some very gripping reading. Flint also finds himself having to deal with the advances of two women, both of whom he is attracted too, both having agendas of their own, so getting involved with either could have a deadly outcome. Frew builds his story well, its conclusion seeing a violent battle taking place as Flint attempts to steal the stolen gold from the rebel leader and his army. Frew also has a surprise twist waiting for the end that I didn’t see coming that brings the story to a satisfying close. *The book I have shows the author’s name as Alex Frew yet those on Amazon etc have the cover showing him as Alexander Frew and that is how he is listed too if you want to search for his books. He has another BHW out in December and that cover shows his name as Alex Frew. 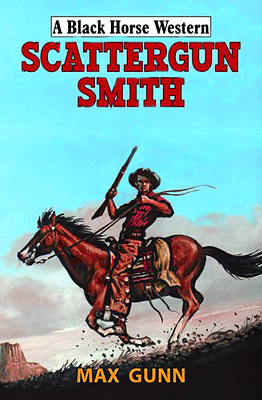 Will Braddock, fifteen years old, continues as a hunter for his uncle’s survey team, as the transcontinental railroad builds across Wyoming in 1868. 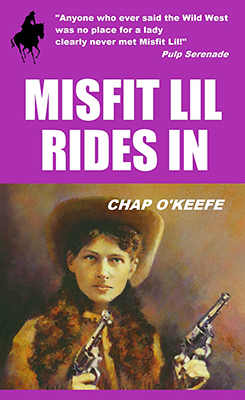 Paddy O’Hannigan, whose vendetta to kill Will, his uncle, and the former black slave Homer Garcon, grows more sinister and involves the theft of nitro-glycerine and an attempt to blow up presidential candidate Ulysses S. Grant. Will remains fascinated with Jenny McNabb but it’s her sister Elspeth who will cause the biggest trouble for him as she becomes a part of a plot to steal from a German aristocrat whom Will is guiding on a hunting expedition. After a vicious bear attack Elspeth falls into the clutches of Paddy O’Hannigan and Will must attempt to free her. Can he save Elspeth and perhaps rid the world of O’Hannigan at the same time? This story begins shortly after the events of the first book in this trilogy, Eagle Talons. All the characters that survived that first tale are back and Robert Lee Murphy introduces us to more, another neat mix of fictional and real people. Like the previous book, Murphy seamlessly blends historical fact and fiction into a fast paced read that will keep you wanting to turn the pages. 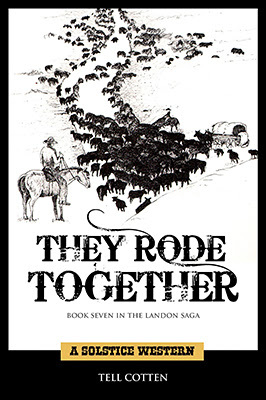 The book is a series of different adventures linked by the people and the quest to build the transcontinental railroad. As well as edge-of-seat action scenes there are also lighter moment too, such as the growing teenage romance between Will and Jenny. And it’s not just Will who could be finding love, his friend Lone Eagle succumbs too, bringing some happiness into his life after the heartache of losing his father, Bullfrog Charlie Munro. Robert Lee Murphy brings everything to an exciting conclusion that leaves some openings for certain storylines to be continued in the third book, one I am very much looking forward to reading in the future. 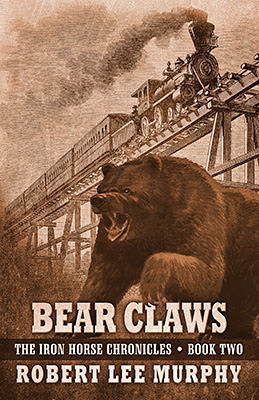 Bear Claws is set to be released in November but can be pre-ordered now. He could see the tip of the hat brim in the doorway of the balcony across the street. Just over the top of the ridge of the mercantile store’s roof, he caught a glimpse of another hat. That meant at least two men were waiting to kill him in cold blood. Ike Murdo knows that awaiting him upon his arrival are several people who want him dead. The risks were clear when he chose to interfere with the gang’s plans. He’d had no choice: when the son of the woman he loved was kidnapped, Ike followed his heart. Now, he must pay the price and confront the gunmen. 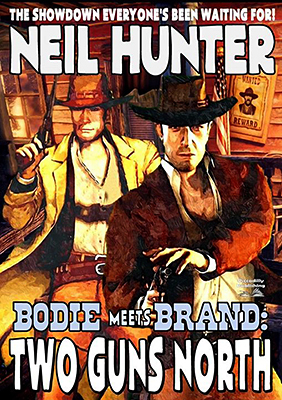 Billy Hall begins his story in an almost gentle fashion as we witness Murdo search for and secure a job that sees him doubling as a cowboy and a farmhand. It’s the latter that provides some fascinating reading as Murdo gets to grips with new methods of ploughing and Hall’s descriptions of this put you right there to witness Murdo’s determination to master these new techniques. During this time Murdo finds himself become more and more attracted to the ranch’s owner and he bonds with her children. But all the time Hall allows the threat of danger to simmer below the surface and throws a few questions into the mix, such as why Murdo doesn’t carry a belt gun. Later Murdo sends a telegraph when danger threatens, but who to? Neither characters nor readers are let in on this secret which adds a touch of mystery to the storyline and this turns out to be a great surprise when the author reveals the answer. As well as fistfights and gunfights there are some excellent confrontations in a court of law that should see off any threat of danger but, of course, they just make things worse and lead to the kidnapping mentioned in the blurb. The rescue attempt gives birth to a legend which put a huge grin on my face and brings the book to an excellent ending that left me eager to read more of Billy Hall’s work. 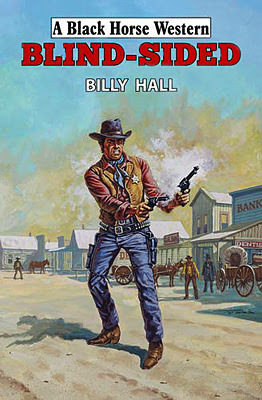 Sadly, it has recently been reported that Bill Hallsted (Billy Hall’s full name) passed away in May 2015, so I would like to take this opportunity to offer my condolences to his family and friends and to let them know that for me, and his many fans, Bill will live on in the words of the many westerns he wrote and will continue to bring us pleasure for a long, long time to come. You want plenty of action? An involving plot that charges forward at the speed of a galloping horse? A storyline full of twists and turns, one of which that could be as equally at home in a horror novel? Demented bad guys with an army of killers? Draw-fighters aplenty? Good-guys escaping their own demons? Fear? Lies? How-they-gonna-get-outta-that situations? Fistfights? Gunfights? Gritty writing that demands your attention? Then this book is a must read! 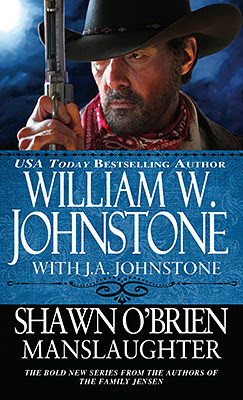 The author brings together an excellent cast of characters, many of whom I hoped just might, somehow, escape the grip of terror, and high death-toll that plagues Broken Bridle, to perhaps appear in future Johnstone books. Who can forget the twins, assassins who’ve never failed to take out their target? And Becker’s gunman, Caradas? Deputy United States Marshal Brown with his bullish ways? The Chinese? The women? Thomas Clouston riding his massive horse whilst wielding a battle-axe like someone from a Frank Frazetta painting? And the strawmen – I still shudder whilst thinking about them. Like the previous Shawn O’Brien book, Town Tamer, this delves into the darker side of humanity, where greed is all that matters and life is cheap. Where madness is the driving force and death feeds well. It seems Broken Bridle is destined to become a ghost town and that O’Brien cannot possibly stop this from happening. Does he? I guess you’re going to have to read the book to find out because I can’t answer that here and thus spoil the book for those who are yet to read it. What I will say is that I’m really looking forward to discovering just what horrors await Shawn O’Brien in the third book of the series, Better Off Dead, which I believe is scheduled for release next February. ‘General Garranza has stated officially that the revolt will be crushed if every tree in Sonora has to bear a bandit’…. In Sonora, Mexico, a revolution was taking place. It started in a small way – and then it gathered speed. Villages were plundered and troop trains ambushed. The rebels, it was rumoured, were being supplied with arms smuggled across the border. And this is where Morgan Kane was called in. 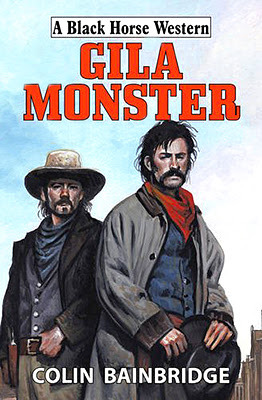 In a dusty one-horse-town in Arizona, he discovered one of the main sources of the contraband ammunition – in the charge of a wicked, greedy old man…. When we first meet Kane he is suffering, trying to drown the pain that tears at his soul in alcohol. Hurt and anguish that have battered his being during his last two assignments in particular. Louis Masterson seems to enjoy tormenting his hero, but in this story he doesn’t add to Kane’s mental distress – although he does take some physical blows from both friend and foe. 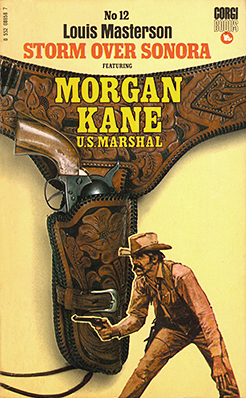 This tale is much more of a straight-forward western that is packed with bloody action and sees Kane struggle with where his loyalties lie. One of Masterson’s strengths is describing landscapes, he paints such vivid imagery with his choice of words and these place the reader right there with his characters, sharing the beauty, heat and harshness of Sonora. The story contains a couple of neat twists too that will see Kane riding towards certain death without a weapon to defend himself against hopeless odds. Something that will have you wondering how he can possibly emerge from this deadly situation in one piece. Kane’s fear and near panic is written so well you can almost see his sweat oozing from the pages. The book concludes with a terrific battle as the rebel army launch an attack on a fort, which brings this tale to a violent end. The final lines of the story will definitely have readers wanting to find a copy of the next book in the series to discover just what horrors Kane will have to face next. For as long as anyone can remember, the People have had a sacred Covenant with their brother Bear. Now, without warning, the bond has been shattered as a bear stalks the People on their annual trip to summer council. Fearing the bear is an evil spirit in disguise, Singing Wolf knows he must take matters into his own hands – even if it means breaking the Covenant, wresting power from his father, holy man Walks in the Sun, and alienating his beloved Rain. But as Singing Wolf and Walks in the Sun each struggle to understand the broken Covenant, their crisis foretells an even greater challenge facing the People – both from within and without. 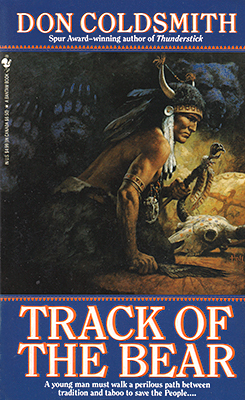 Once again Don Coldsmith’s exceptional ability to write a gripping tale shines through in this story of the struggle to understand spiritual beliefs. The question of why the bear has begun killing the People needs an answer before they can begin to plan how to stop the animal without destroying it and thus giving a death sentence to the creatures’ killer. Amid the beautiful described landscapes and seasonal change Coldsmith really does capture the frustrations of lack of understanding that twists the soul of Singing Wolf and those he confides in. You’ll share those torments with the People as Coldsmith’s words captivate your imagination, you’ll feel their sorrow as the death count mounts, you’ll find yourself wondering just how this bear, that never shows itself except to those it kills, can possibly be stopped without bringing even greater tragedy down on the People. Coldsmith solves the problem in an obvious yet unpredictable way that both shocks and surprises. Followers of the series will definitely feel the pain that this conclusion brings to the People, making this book a not to be missed read in the series. It’s been a while since I read a Spanish Bit novel and this one has left me very eager to read the next in the series as soon as possible.